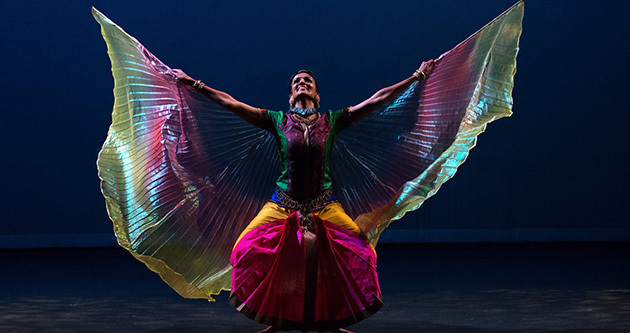 Atlanta, GA: Dance lovers in Atlanta had the opportunity to witness a unique solo dance-theater style presentation by acclaimed Bharatnatyam artist, Savitha Sastry at Southern Polytechnic State University’s Joe Mack Wilson Auditorium on July 11. In her 75-minute production, ‘Chains, Love Stories of Shadows’, Savitha breaks away from traditional Bharatnatyam narratives to tell a contemporary, everyday story that resonates with today’s woman. 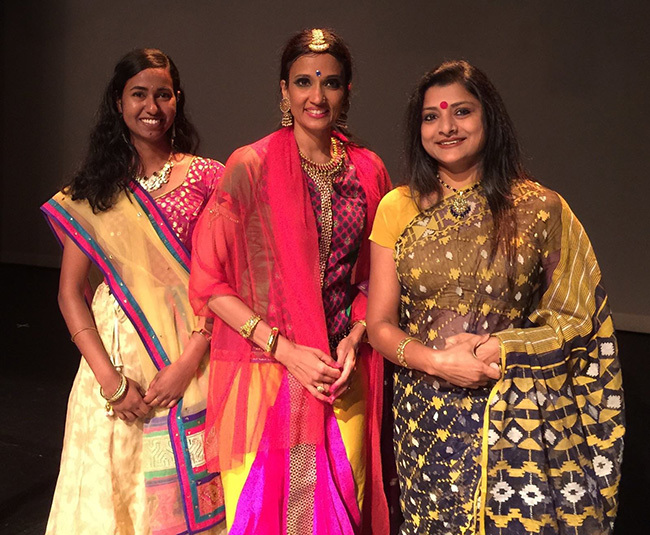 Savitha Sastry (center) with Anupa Thakurta (R). Based on a trilogy authored by Sastry’s husband, A.K. Srikanth, ‘Chains’, which draws its inspiration from everyday life incidents, takes an empathetic look at today’s woman and her life. Is there room in a woman’s life to do what she wants, or is her life a compromise of the expectations of her family and the society she lives in? ‘Chains’ explores the dividing line between free will and compromise, as it charts the life story of its protagonist, Vichitra. At 16, Vichitra is filled with vivacity and joy. In the shy and gauche Adhvik, Vichitra find her first love. But her love story comes to an end when her parents refuse to accept Adhvik, and Vichitra is sent away to a distant land. Years pass. Vichitra is now married to a man chosen by her parents. Her life revolves around her in-laws and children. But everyday is mundane, exactly the same- marital bliss also means a dissolved identity. But at night, in her sleep, Vichitra dreams of being beckoned by an unknown silhouette in the light. She hesitantly moves into the spotlight and dances to the music she hears. In this state, she experiences freedom from her everydayness. As time moves on, Vichitra spends more and more time in the spotlight, dancing, until she hears the voices of her family shattering the dream. Does she have to choose one over the other? Time passes, and Vichitra, now advanced in age, is pursued by loneliness, which she ultimately comes to accept and love. In the final act, the world thinks she has lost her mind; forever in conversation with an invisible entity. But Vichitra is at peace with solitude, whom she regards as her companion, her shadow. Called the ‘Dancing Storyteller’ by the critics and audience, Savitha is widely credited as the architect of the renaissance in Bharatnatyam in recent times. Her brilliance lies in her ability to communicate with the audience, evoking emotions through modern story telling. Her tight-knit production team also plays a big role- creating appropriate lighting, backdrops, music and voice-overs to convey different moods. The haunting, contemporary music for the presentation was created by Rajkumar Bharathi, the grandson of Subramanya Bharathi. The program was a fundraiser for Baal Dan Charities, a non-profit that supports the basic needs and social welfare of impoverished children (mostly orphans and street children) in Asia, Africa, North America and South America. Given the vast number of impoverished children in these regions, Baal Dan’s initial work and presence was focused onIndiafrom 2006 to 2012. Baal Dan expanded to many more developing countries in 2013. Since then, the charity has maintained its commitment to providing aid for grassroots organizations that need support and through providing education as a means to break the cycle of poverty.